It’s the final week of the semester, so it’s time for a little fun in the world of weather and climate visualizations. One of the toughest things that Geologists have to deal with is conveying a sense of time scales. It’s difficult for present-day humans to conceive of how long ago (or recent) the Roman Empire or Han Dynasty were, let alone 4.6 billion years of Earth history. We often use interesting comparisons, like how the time gap between Tyrannosaurus (68-66 million years ago) and humans is smaller than the gap between Tyrannosaurus and Stegosaurus (155-150 million years ago). Sometimes we use analogies, like how an average human lifespan is 0.00000204% of all Earth’s history, which is about the same percentage of your life you just spent reading this paragraph. 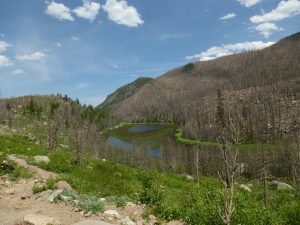 With climate change, scientists often are approached with the question: “Climate has changed before, so why is this time worse?” An important is that this time it’s changing very fast, and rapid change is more problematic than gradual change. The faster the change, the harder it is for plants and animals (and humans) to adjust. But conveying that sense of rapid change can be difficult when our time series are so long, stretching tens of thousands of years. It rarely looks good on a single powerpoint slide or a single 8 1/2″ by 11″ piece of paper. You either have to scrunch everything into a very condensed and crowded graph, use an inset box to zoom in on today, or use multiple slides/figures. Or… you could use the tendency for modern webpages to scroll indefinitely to convey a sense of time. This is the tactic of the webcomic xkcd. No, seriously. The main reason for reading the comic is to laugh at the little bits of humor slipped in, but Randall Munroe at xkcd is diligent about scientific research. The temperature data for the visualization are based on a combination of HADCRUT4 (from the UK Meteorology Office), the Intergovernmental Panel on Climate Change (IPCC, funded by the UN), and peer-reviewed journal articles in the journals Nature (Shakun et al. 2012), Science (Marcott et al. 2013), and Climate of the Past (Annan and Hargreaves 2013). Those last three are all paleoclimate reconstructions. There’s two weeks left in the semester, so today on Climate Monday we’re going to take things to the next level and highlight not only visualization, but also analysis of climate data. Most of the big papers in climatology nowadays involve more data than you can shake a stick, and they require so computer science chops to make happen. However, if you’re in the exploration phase, going through all that coding can be excessive work and it’s better to have a quick-and-dirty tool to get a sense of what’s going on. 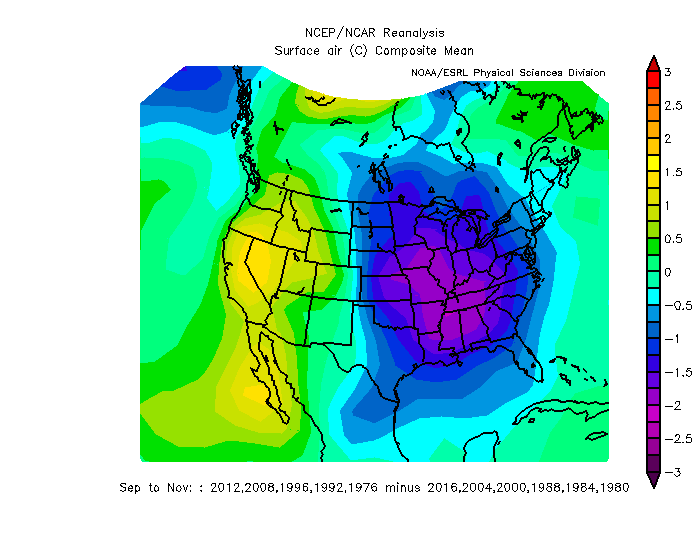 The tool my PhD advisor always uses is the NCEP/NCAR reanalysis compositor. 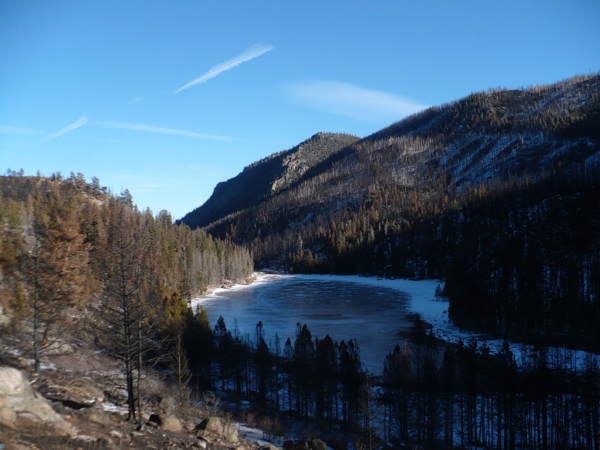 “NCEP” is the National Center for Environmental Prediction and “NCAR” is the National Center for Atmospheric Research. But what is a “reanalysis”? Well, to start we have to define an atmospheric “analysis”. And to do that, we actually need to start with an atmospheric weather “forecast”. Whew. A weather forecast might be familiar; it’s an assessment of what atmospheric conditions are likely to be sometime in the future. Today, our weather forecasts are derived from weather models. We may like to joke about how bad they are, but for predicting the weather an hour from now, weather models are extremely accurate throughout most the US (especially in flatter areas like Ohio). However, these models are not perfect, and the analysis process accounts for that. To make an analysis, you also need to gather a bunch of atmospheric observations. These can be from a variety of sources, like aircraft, ships, land-based stations, weather balloons, or satellites. If you take, for example, the wind forecast for 6 AM that was made back at 5 AM (i.e., the 1-hr forecast — Step 1A in Figure 1) and then compare it to observations (Step 1B), you’ll find that they don’t line up perfectly (Step 2). The “analysis” step is to alter the 1-hr forecast so that it more closely matches the observations (Step 3). The best solution usually is not to make the forecast perfectly match observation points, because observations have error too. Indeed, the model is often more accurate in places that are remote (e.g., the Arctic Ocean) or notoriously “noisy” for data collection (e.g., Mount Elbert in Colorado). The result of this assimilation process is the “analysis” (Step 4). This analysis then becomes the input for the next 1-hr run of the weather model. The difference between an “analysis” and a “reanalysis” is that the former is operational while the latter is academic. In practice, weather forecasters are constantly tweaking their models to improve forecasting, but that can lead to weird biases in long-term data; model output from 1980 is not directly comparable to model output from 2015. 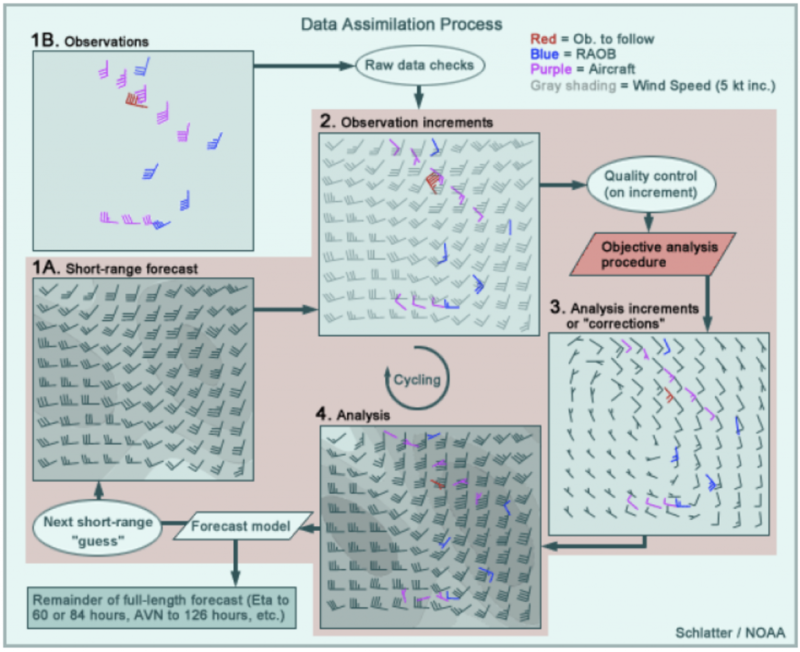 So with a “reanalysis”, researchers decide on a single model set-up and re-run everything. That’s right: for every hour, they re-run the model, re-run the assimilation of observations, and spit out an analysis. 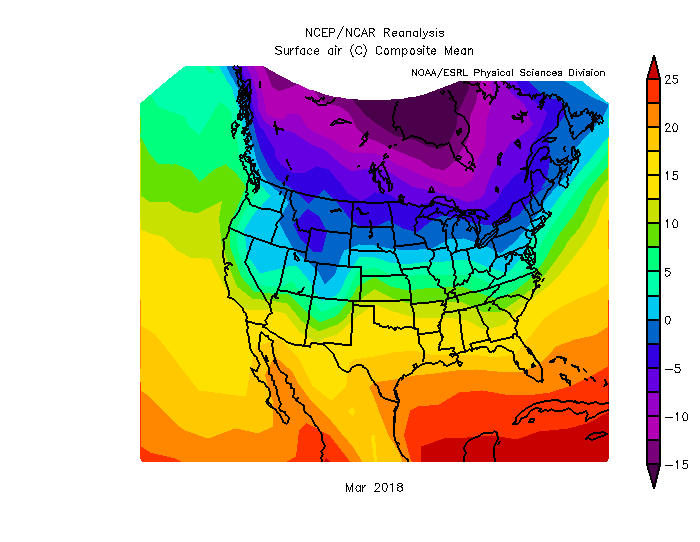 This is what the NCEP/NCAR reanalysis tool is, and it’s a great way to start thinking about climate analysis instead of just weather analysis. That’s good, but you can see all of this at NOAA’s website, too for the past month with fewer clicks. 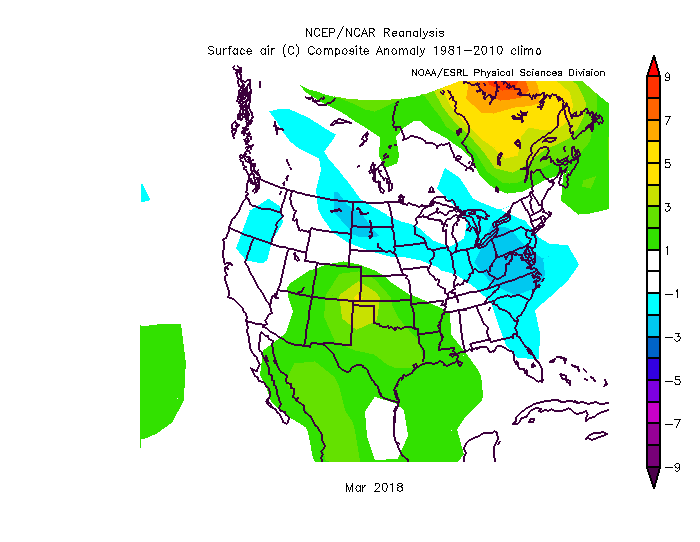 So what makes the NCEP/NCAR compositor special is the ability to composite random years together and keep experimenting until the cows come home. For example, did you know that in the autumns (Sep, Oct, Nov) with presidential elections, years in which the USA elects a Democrat tend to be cooler in the East and warmer in the West? (Figure 4). Now, I don’t think that’s a significant result, and I doubt it really means anything. On the other hand, knowing politics, don’t be surprised if you start seeing Republicans with hair dryers in Michigan come October 2020. Figure 4: Difference in Sep-Nov surface air temperature between years in which a Democrat won the presidential election in the US minus years in which a Republican won. Source: NCEP/NCAR Reanalysis. Next month we will have posts from the project! It is work Caroline Buttler (Head of Palaeontology at the National Museum Wales, Cardiff) and I pursued as our first joint project. An early version is described in this blog post. Thank you to Caroline for her leadership, and the Luce Fund at The College of Wooster for its support. If you want a pdf of the paper, just send me an email note. St. George, Utah — Today I met Jerry Harris, Professor of Geology at Dixie State University in St. George. He was very friendly, generous and knowledgeable, guiding me to two fantastic Carmel outcrops I would not have approached on my own. 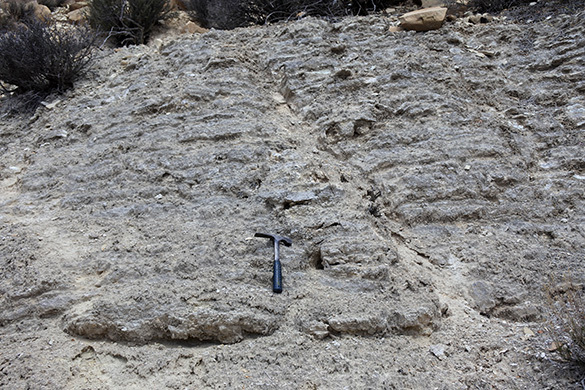 Shown above is one complete section of the Carmel Formation in the Dammeron Valley. 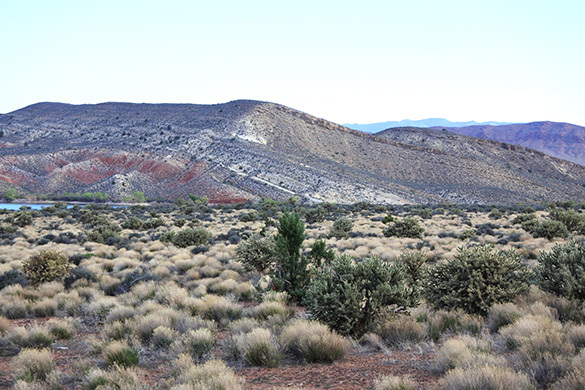 The reddish rocks in the lower right are the underlying Temple Cap Formation; the top of the ridge is the end of the Carmel here — it is unconformably overlain by the Iron Springs Formation (Upper Cretaceous). This is an extensive exposure perfect for exploring. The red unit here in the Dammeron section is the top of the Temple Cap Formation. I’m not sure if the Carmel commences with the green marls, but classic Carmel limestone is found immediately above. 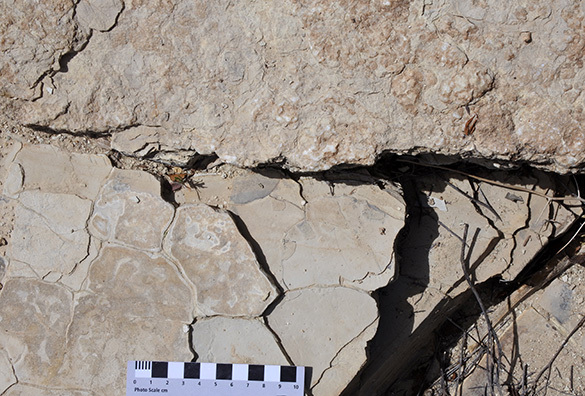 A curious unit within the lower few meters of the Carmel is this bedded gypsum deposit. It represents a significant accumulation of evaporite minerals, and thus the evaporation of a lot of seawater in an enclosed basin. The Carmel limestones show normal (but restricted) seawater and lots of evidence of high energy. 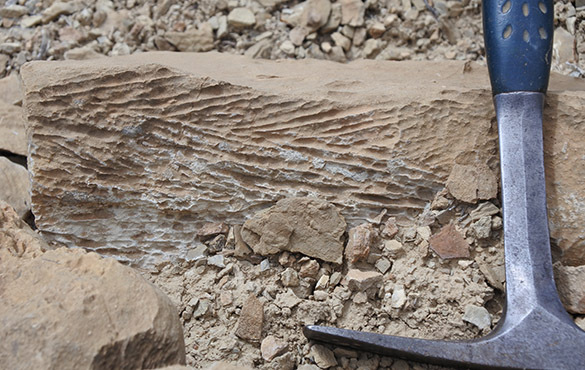 These carbonate crossbeds are almost herringbone. This is a view west from the top of the Dammeron Valley section. In the distant left you can see the familiar Square Top Mountain and pointy Jackson Peak. On the right is the majestic Veyo Volcano. 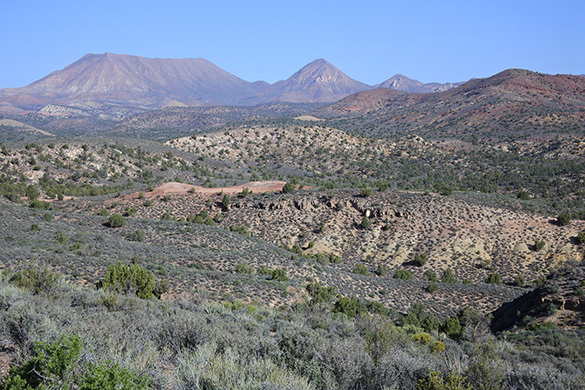 The Gunlock exposures are just a few kilometers away, but no outcrops connect them to the Dammeron Valley. Jerry Harris also showed me large exposures of the Carmel Formation in Diamond Valley, a few kilometers south of the Dammeron Valley location. 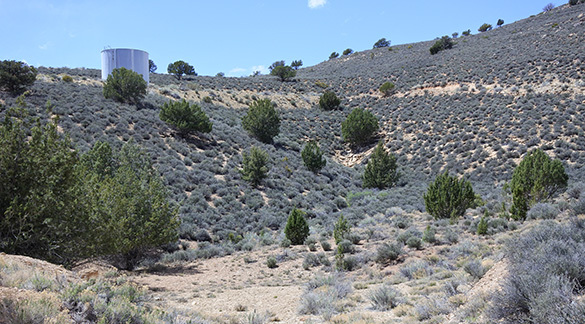 It is not picturesque, but there is plenty of Carmel under that sagebrush. The excavation for that water tower turned out to be especially good for shelly fossils, so Jerry took me there right way. 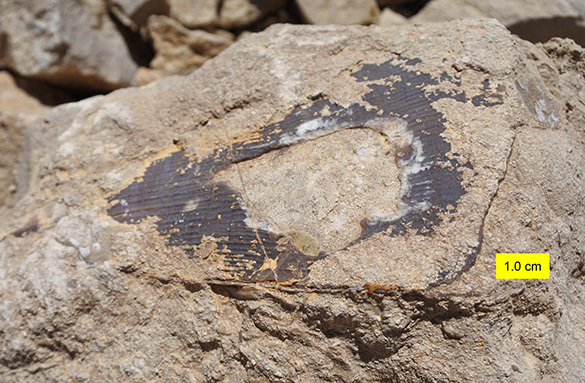 The most common fossil is the pectenid bivalve Camptonectes. It has calcitic valves, so they are well preserved, unlike the numerous aragonite-shelled mollusks in the Carmel that are seen only as ghostly molds. To my delight, some of the bivalves at this locality are encrusted by small cyclostome bryozoan colonies. 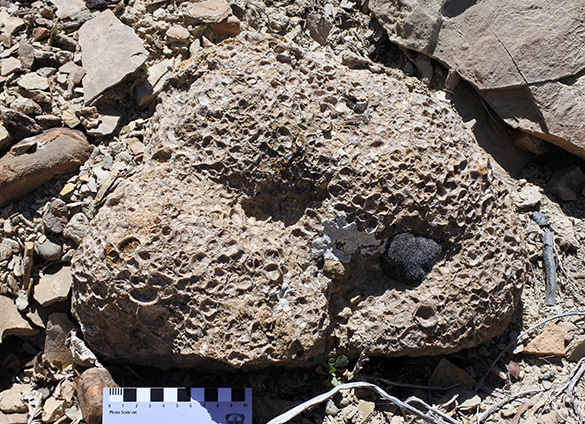 Jurassic bryozoans are very rare in North America. In fact, Paul Taylor and I have described most of them from the Carmel! (Taylor, P.D. and Wilson, M.A. 1999. 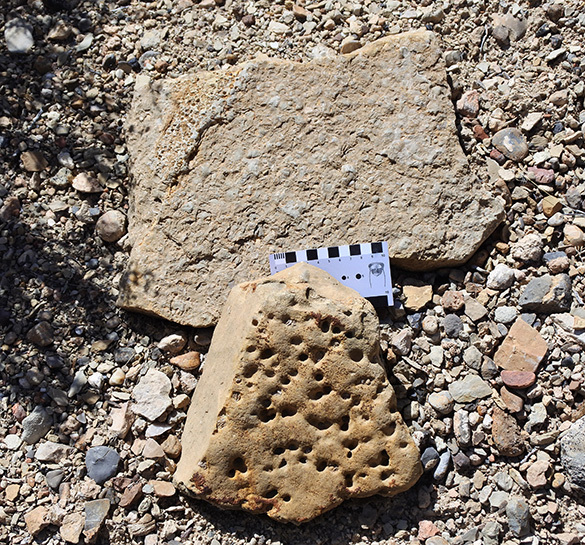 Middle Jurassic bryozoans from the Carmel Formation of southwestern Utah. Journal of Paleontology 73: 816-830.) The exquisite bryozoan colonies above are as good as any we’ve found before. A thorough study of all the Carmel sclerobionts is worth pursuing. There are also nice wedge-shaped limid bivalves at the water tank exposure in Diamond Valley. 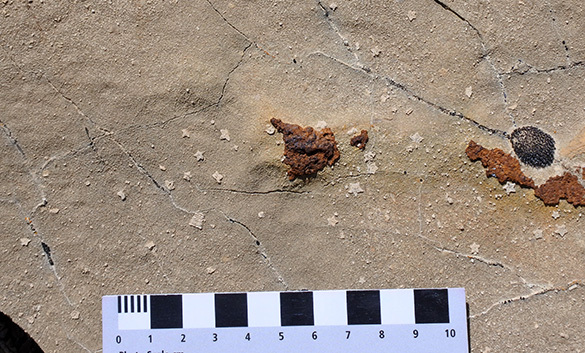 These fossiliferous slabs have lots of treasures. I only wish they were more common in the Carmel. Here’s a simple Google Maps image of my three main areas of study north of St. George. 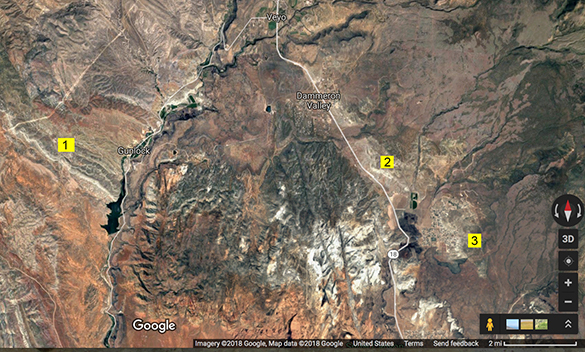 1 = Gunlock, 2 = Dammeron Valley, 3 = Diamond Valley. 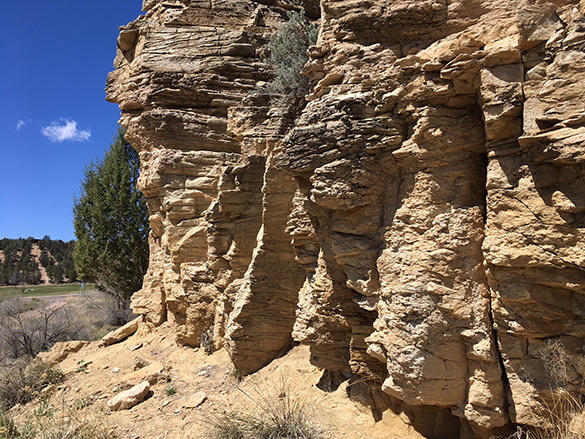 Curiously, the most fossiliferous part of the Carmel Formation (the upper unit of the Co-op Creek Limestone Member) differs significantly between Gunlock on the west and the two valleys on the east, even though they are only a few kilometers apart. The Gunlock area has oyster balls and hardgrounds, which are absent in the east. 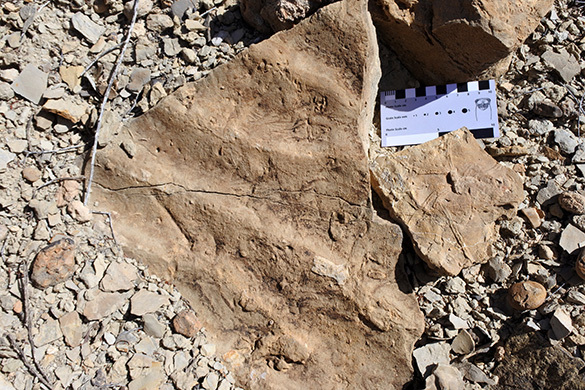 The trace fossils are also more abundant and diverse in Gunlock than in the other two sections. 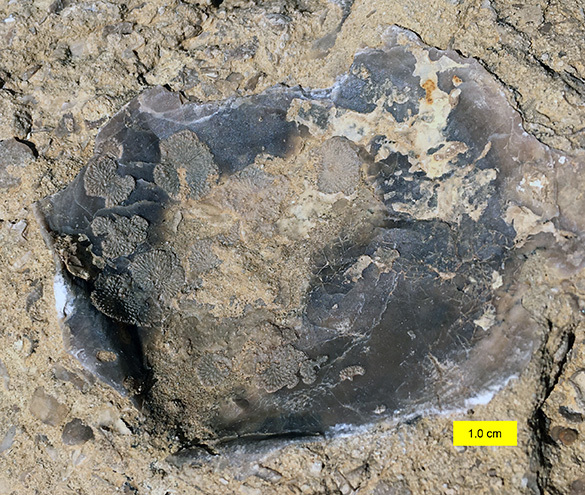 Shelly fossils, though, appear to be more common in the east. It will be fun to sort out these facies differences in more detail. 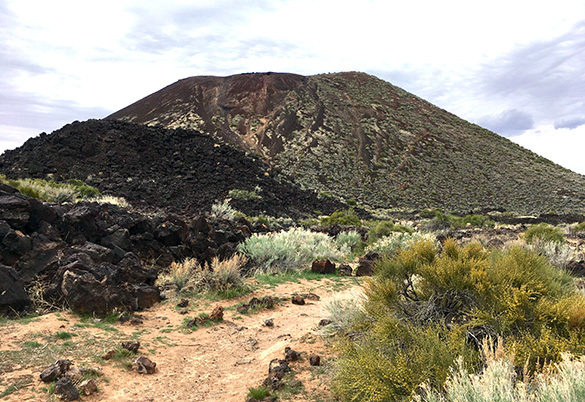 Finally, I wanted to include an image of the cinder cone and lava flows at the entrance to Diamond Valley. They are within Snow Canyon State Park and have been dated at an astonishingly young age of 32,000 years. Great day, great scouting trip. Thanks again to Jerry Harris and Andrew Milner! St. George, Utah — Back to the Gunlock region for me to revisit old Carmel Formation research sites to check for access issues and new exposures. This trip has also given me a chance to update my images of the unit. Most of my previous images are shockingly on film. I’ve been in this business a long time. Above is one of my favorite Carmel outcrops, the cliff at Eagle Mountain. 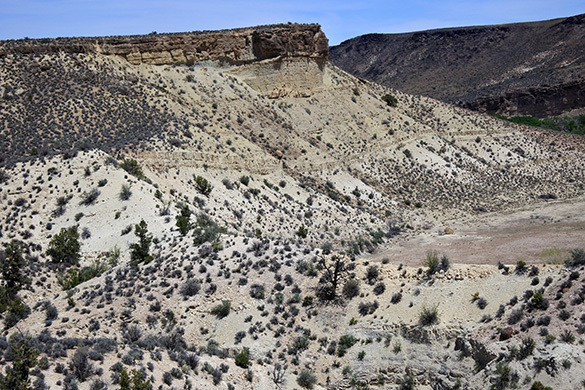 The white and buff layers are the Co-op Creek Limestone Member of the Carmel Formation (Middle Jurassic). They are topped by a thick, well-cemented conglomeratic sandstone, The Iron Springs Formation (Upper Cretaceous). This is a nice example of an erosional disconformity between the units with an interval of time unrecorded (a hiatus). The cliff is on private land, so I’m in the process of finding the owners. The image was taken looking northeast from: 37°18.428’N, 113°44.408’W. Today I looked at some smaller details in the Carmel sections. I found these exquisite mudcracks near the Eagle Mountain locality. This is solid rock, even though the cracks look modern. This shows, of course, that this patch of muddy seafloor dried out, producing the cracks by desiccation of clay minerals. On top of the mudcracked layer is a thin carbonate bed with vugs and cracks filled with gypsum. This represents a hypersaline environment where gypsum and/or anhydrite was precipitated as evaporite minerals. We thus went in time from a dry seabed to one covered by shallow briny water. 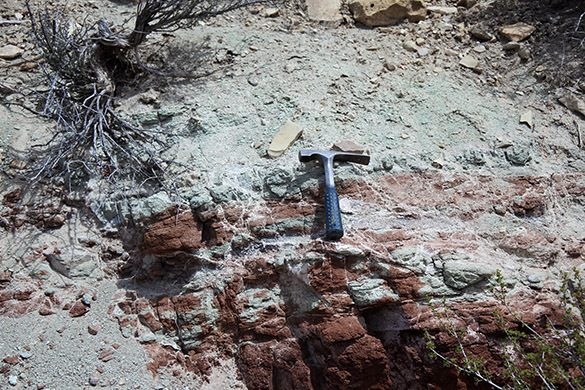 Within the gypsum-rich layers are intraclasts of carbonate mud derived from the mudcracked layer below. When the seawater returned it had enough energy at times to rip up pieces of the hardened mud below. Finally, on top of the gypsiferous layer is a limestone rich in star-shaped crinoid debris (ossicles of Isocrinus nicoletti). This represents the influx of normal marine water, albeit in a restricted context. As far as I can tell, there are multiple triplet layer sets like this near the middle of the Carmel in the Gunlock area. What was controlling these changes in sealevel and chemistry? I would be neglecting my duties as a geologist if I didn’t mention that there is much more to the geology here than the Carmel Formation. 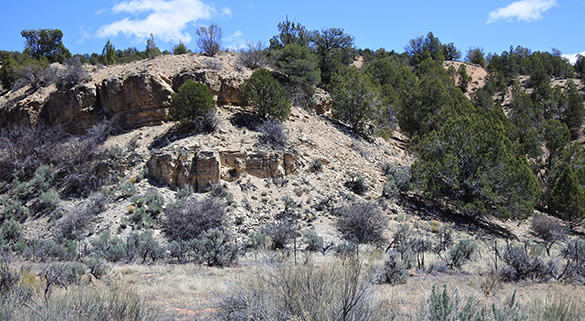 Above we see the underlying Navajo Sandstone with its massive cross-bedded eolian dune features. 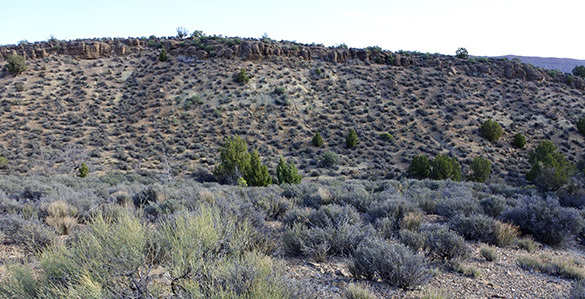 The Navajo is topped here by thick basaltic lava flows of Pleistocene-Holocene age (the Santa Clara Volcanic Field). Lovely place for a geologist! 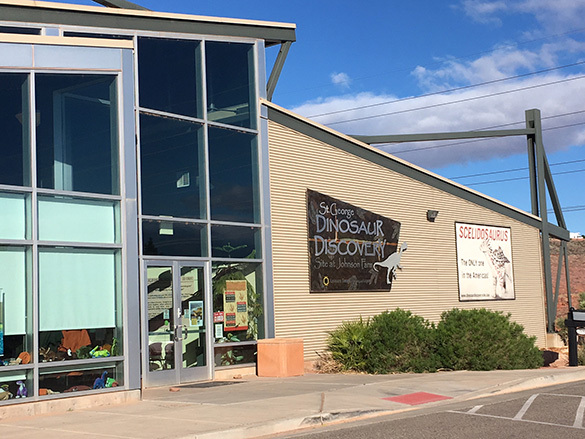 Kanab, Utah — My day began with a visit to the St. George Dinosaur Discovery Site at Johnson Farm, where I met Andrew R.C. Milner, the Site Paleontologist and Curator. This museum is built over an extraordinary set of dinosaur trackways. These tracks were not even discovered when I started working in the area, and now this building houses a busy and productive center for vertebrate paleontology in the region. Andrew is a dinosaur paleontologist and an expert on vertebrate trace fossils, and he also knows a lot about the Carmel Formation and its outcrops in Utah. He gave me local contacts, and will join us in the field when we start the official Utah Jurassic expedition next month. He has been very helpful. I then drove to Mt. Carmel Junction on the eastern side of Zion National Park, about two hours from St. George. It is a small place with a surprisingly long Wikipedia page. 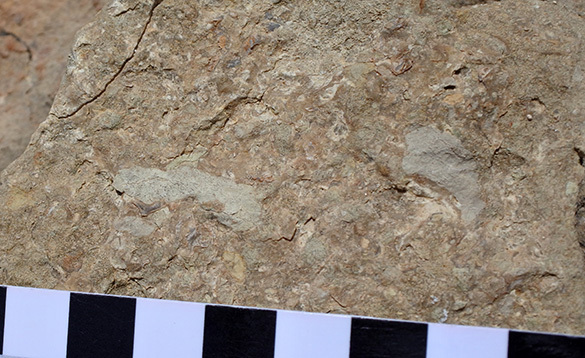 It sits in the center of several extensive exposures of the Carmel Formation, including this cross-bedded unit made almost entirely of crinoid ossicles. These rocks are called encrinites. This particular Middle Jurassic encrinite is one of the youngest known. This exposure is at Stop #5 of Tang (1997). It is still easily accessible at the northwest corner of the junction. Alas, this great expanse of Carmel Formation, known as Stop #6 in Tang (1997) is no longer accessible, at least not easily. If you look carefully you can see a barbed-wire fence at the base of the outcrop. I could find no evidence of who owns this land, and jumping a fence out here can have serious consequences! Unfortunately there are far more such fences here than were present in the easy-going 1990’s. This makes taking students here harder for casual examinations of the rocks. I spent the night in nearby Kanab, Utah, where I got to spend excellent time with my Father, who was in the area hiking with two friends. I then drove back to St. George the next morning, passing through a long stretch of northern Arizona. This included driving by the storied Colorado City of FLDS fame. Follow those links if you don’t know the story! 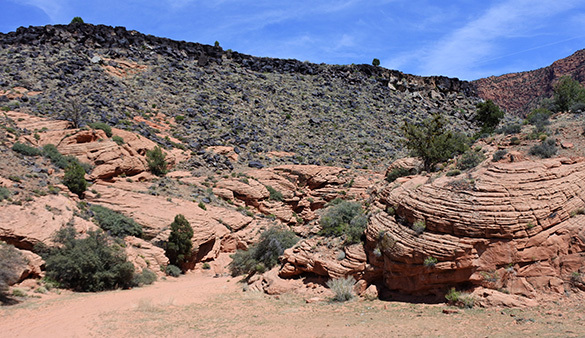 The Carmel Formation is 100 to 300 meters thick, more or less, through parts of southern Utah. It is relatively thin by Utah Jurassic standards. It is a mostly marine unit, having been deposited in a narrow restricted seaway. I’ve long been fascinated by its fossils, which are almost entirely mollusks and traces of arthropods. It is time to revisit these exposures with new eyes and ideas. 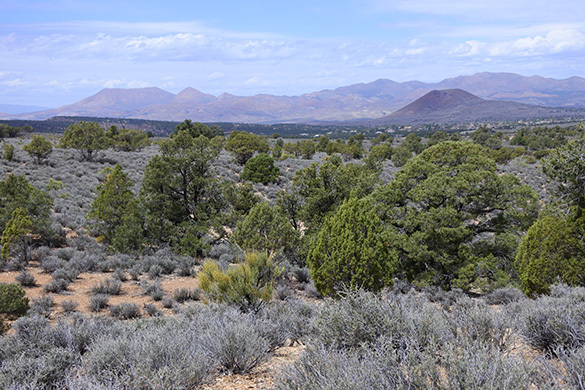 This is a view looking north across typical Carmel Formation outcrops about a half-hour northwest of St. George. The rocks are exposed in strike valleys, which are great for finding bedding plane slabs with fossils and sedimentary features, but miserable for constructing stratigraphic columns. Luckily most of that tedious work is done. In the background are two iconic mountains for the area: Square Top and Jackson Peak. In April 1983, a B-52 bomber tragically crashed into Square Top. 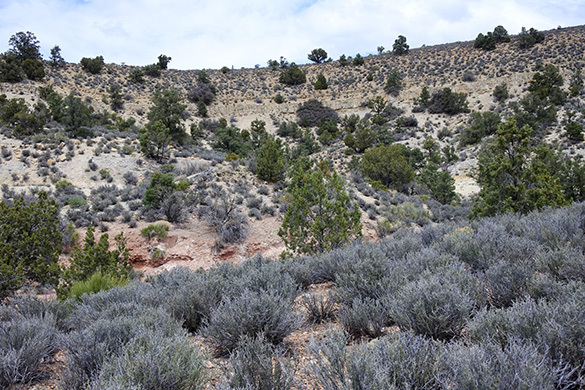 The Carmel Formation is capped unconformably in this region by the Upper Cretaceous Iron Springs Formation, a conglomeratic sanadstone here. It is cemented well, capping the less resistant Carmel limestones and claystones below. This is a typical strike valley exposure of the top of the Carmel. 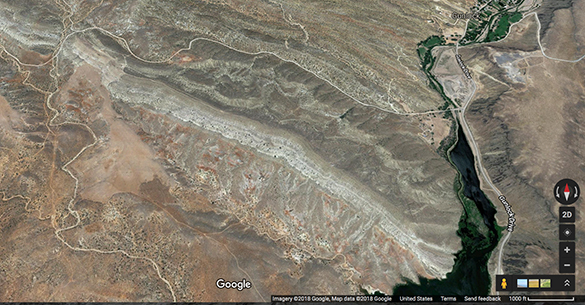 This is a Google Maps view of today’s field area, which is in the middle of the image stretching diagonally from the reservoir in the southeast (right) to where the dirt road bifurcates in the northwest. 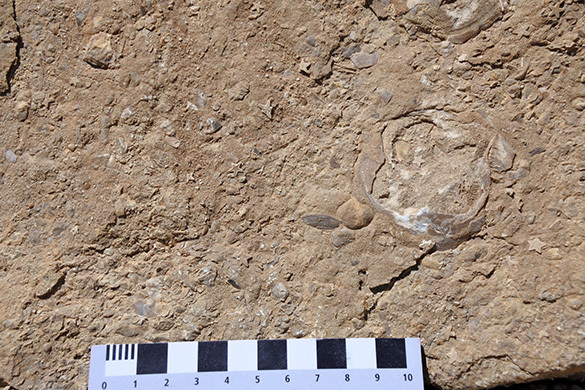 One of the interesting features of the Carmel is a widespread carbonate hardground. 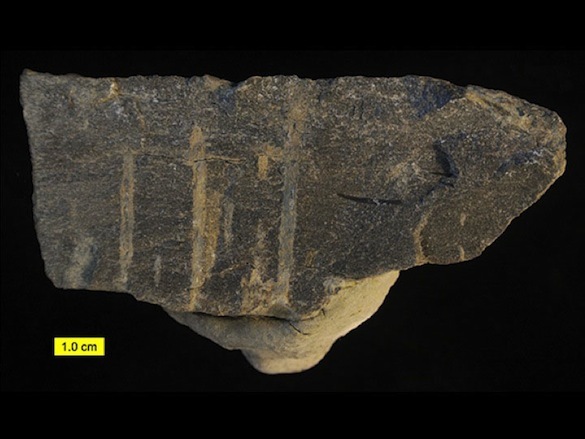 Tim Palmer and I published on it a long time ago, but there are still many questions about its formation and the variety of borings on its surface. 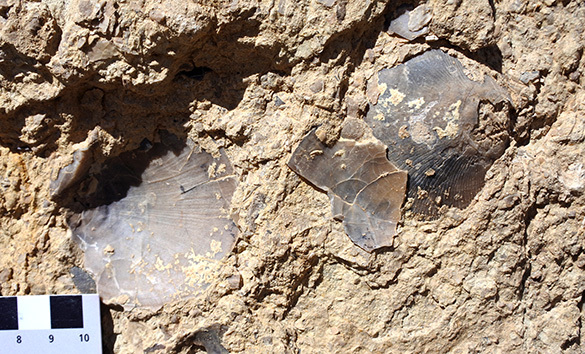 Above are two fragments found loose in a wadi. 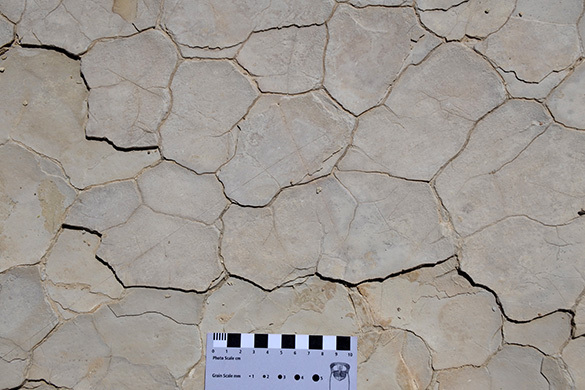 The Carmel has beautiful sedimentary structures, like the ripples on the left, and cool trace fossils like the arthropod trackway (Gyrochorte) on the right. I’m intrigued with the dominant oysters in the Carmel: Liostrea strigilecula. They formed “oyster balls” (ostreoliths) almost unique to the Carmel, and these large masses of unknown origin and significance. They seem to be small reef-like forms, but also show signs of occasional overturning. They hosted encrusting bryozoans and boring bivalves. An early morning view of my field area. The reddish unit below is the Temple Cap Formation, with the base of the Carmel white turning into, shall we say, carmel-colored. 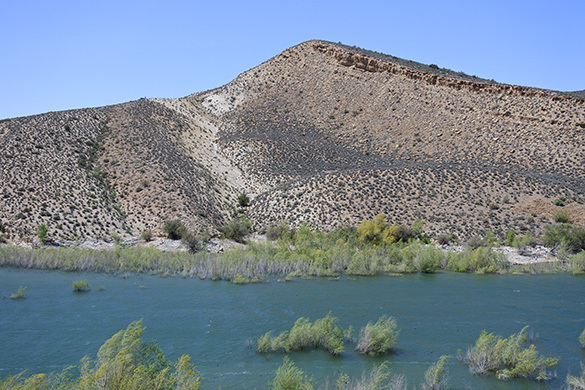 The water is part of the Gunlock Reservoir. Today I sorted out access to a few old localities, and found some new ones. Much has changed here in the last 20 years. There are new roads in and around the growing cities of St. George and Santa Clara, the Santa Clara river has been further managed with massive earthen works (in response to frequent flash floods, no doubt), and there seem to be new barbed-wire fences across some Carmel exposures. Nevertheless it felt like old times as I tramped across the gravelly hillsides scanning the ground for geological treasures. 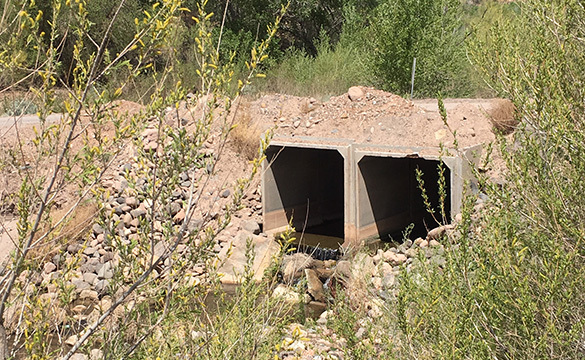 I must add as a footnote an image of this ugly-but-simple bridge over the Santa Clara River at Miner’s Canyon. For years my students, colleagues and I waded through the river here because the water was too deep for our rental vehicles. This meant we had lots of walking to do once we were on the other side, including walking back loaded with rock samples. Now we can just drive across. I have a feeling, though, that this bridge will not survive the next flash flood! The semester is winding down, so we only have a few more of these climate visualization posts to go. Today, I want to highlight repeat photography. Taking a picture of the same place several or many years apart can be a striking demonstration of change and capture the imagination better than a sterile graph or abstract map. The flashiest examples applying the idea to climate change come from productions like Chasing Ice by the Extreme Ice Survey or Chasing Coral by Exposure Labs. (Chasing Coral was recently featured here at the College of Wooster as part of the “Great Decisions” series.) The products can be truly fascinating, especially when many photographs are combined in a time lapse video. For example, the video of the Extreme Ice Survey’s repeat photography of Mendenhall Glacier, embedded below, gives a better impression of glaciers as flowing masses of ice than any single photograph or model simulation. It also shows the decline in mass at the toe of the glacier between May 2007 and August 2011. First, you need to have not only the same location, but the same angle for your shot, showing the same context around the feature of interest in each and every photograph being compared. This is why the Extreme Ice Survey set automated stations with the cameras well-mounted rather than using hand-held cameras. Much of the Chasing Ice documentary is about building and installing the equipment necessary to achieve this fundamental “rule” of repeat photography. The Chasing Coral team tried similar techniques, only with the added complication of being under water. Needless to say, it was harder for the Chasing Coral team. Second, any repeat photography of environmental phenomena had better avoid making natural seasonal cycles look like climate change. The two pictures of Sub Lake in Rocky Mountain National Park above were taken in June 2015 and January 2013. The difference between the two isn’t climate change; it’s winter. Another example: The Mendenhall Glacier video shown above is labeled as “May 2007 to August 2011”. A red outline of the glacier in the first frame is compared to the outline of the glacier in the final frame, and that’s a little deceptive. Just like snow cover and sea ice, the Menhendall Glacier has a greater extent and thickness at the end of winter than the end of summer — especially at the toe. So part of that difference you’re seeing is just the fact that a) over 80 inches of snow typically fall on the toe of the Mendenhall from October to March and b) the average high temperature is over 60°F in June, July and August in southeast Alaska. It’s likely to look more robust in May than August, so the time lapse would be better starting and ending in the same month. Third, climate change is not the only factor that determines whether one year is cooler or warmer or wetter or drier than the last. Climate change is not the only factor that determines whether coral bleaching will occur or whether a glacier will retreat. For example, in Chasing Coral, a coral bleaching event in Australia is highlighted and attributed to climate change. At the same time, though, an El Niño event was occurring. El Niño is a natural part of the climate system, but it can also lead to warming and coral bleaching. Was global warming a factor in this bleaching event? Absolutely, but the devastation depicted in Chasing Coral may have been less overwhelming in a La Niña or normal year. As another example, if you were trying to take pictures in Washington DC to show how the date of cherry trees blooming was coming earlier each year, you might be disappointed. Although blooming is now occurring on average about a week earlier than in the 1970s, peak bloom was actually slightly later than average this year. The best way to get around this issue is to have several decades between the start and end of the repeat photography pair or sequence. With all these rules in mind, the United States Geological Survey (USGS) is currently undertaking a repeat photography project for the failing glaciers of Glacier National Park. They’re also soliciting help from visitors in a crowd-sourcing effort. The time spans exceed 50 or even 100 years for these photos, which is enough time to see some truly remarkable changes to Glacier National Park’s namesakes. It’s even long enough to avoid the seasonal issues discussed above. As an example of the output, below is repeat photography of Boulder Glacier (1932 to 2005) from the Northern Rocky Mountain Science Center (NOROCK). It snowed in Wooster today. It also snowed in Pennsylvania, Michigan, Iowa, Maryland, and several other states. Across the Northeast and Midwest, baseball broadcasters, news anchors, my coworkers, and even random people on the street are remarking on how “It sure doesn’t feel like spring”, and “why won’t winter go away.” Actually, this refrain has been happening since a series of big storms pummeled the East Coast in March. So of course I wonder: how uncommon has the late winter/early spring weather been? So yes, the East Coast was a bit colder than normal, but only by a few degrees Fahrenheit in most places. Maybe people in eastern Montana had better reason to gripe about the weather than anybody in the Midwest or Northeast. In was 10°F colder than normal up there. 2. For a little more analysis, check out the NOAA News section. This week, they have the summary for March 2018. They provide some context in addition to the maps on this site. 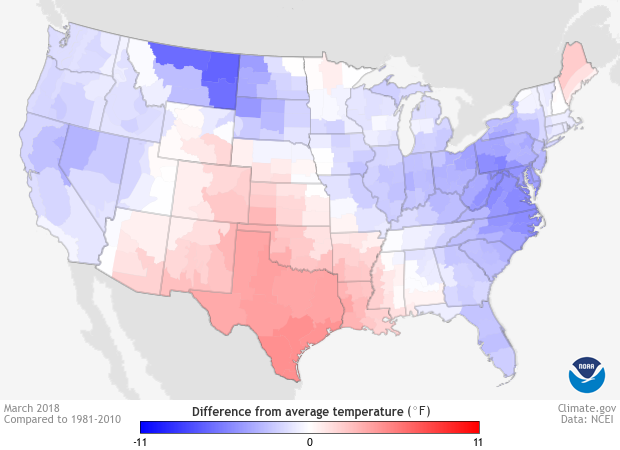 They also use a different map for showing whether it’s been colder or warmer than normal. 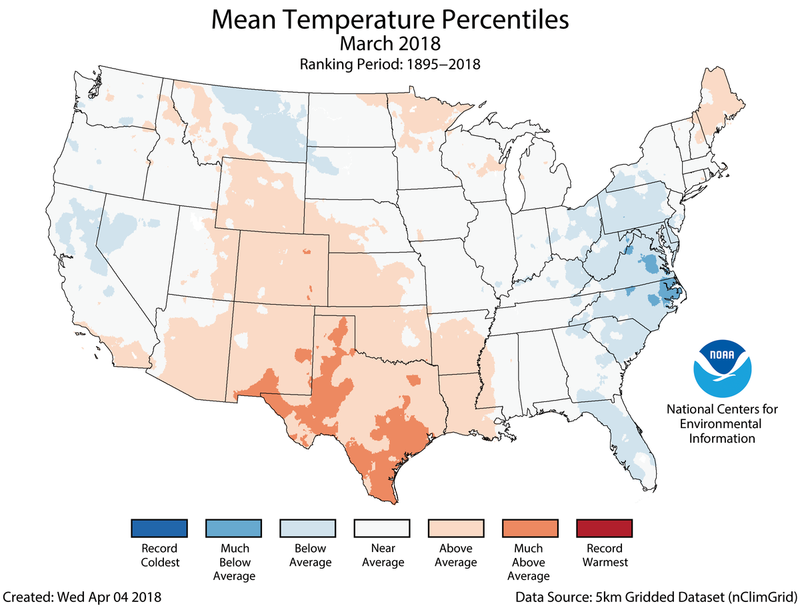 This map is a percentile map; instead of showing how warm or cold compare to normal it was in °F, it asks, what percentage of Marches were colder (or warmer) than this one? Here we can see that although eastern Montana was about 10°F colder than normal on average in March, that’s par for the course in Montana. The temperature varies widely out there on the northern plains, so an erratic March is nothing new. 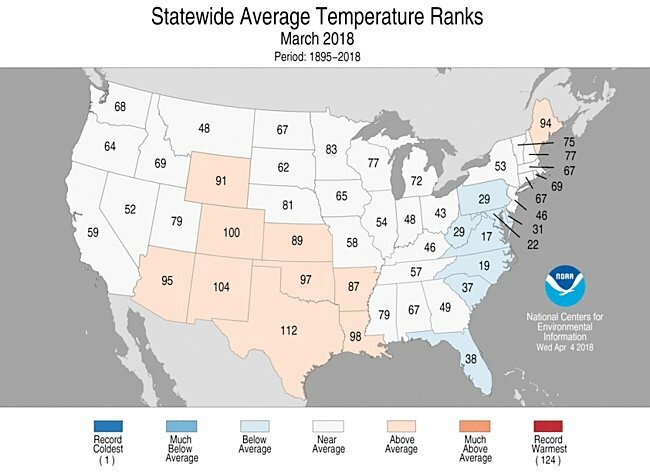 In North Carolina and Virginia, however, having a March that is 5 or 6°F colder than normal is something rare, so pockets of those states came in “much below average”. In other words, just as the average temperature in Montana is colder than North Carolina, the temperature in Montana is also more variable than in North Carolina. When you do that, the whole story of the East Coast be cold and snowy (and it was snowy, for sure) pops out even more distinctly than eastern Montana — because overall, the state of Montana was pretty average. Some of the detail is lost for big states when state-level data are used, but they also have some appeal — it’s easier to think in states than the the divisions used in the previous two maps, after all. So getting back to today, what do the numbers say for Wooster. Well, Sunday April 8 was the coldest day recently, with a low temperature of 23.5°F at the weather station at the OARDC just south of town. The record low for April 8 is 14°F, set in 1982. The average is 33.0°F. So no, this wasn’t record cold for Wooster. But it was pretty low — only 12 years (about 10%) since 1900 had a lower daily minimum for April 8. Also, of the 52 years with non-zero precipitation on April 8, a total of 11 of them had snow — that’s 21%. (It drops to 19% for April 9.) In other words, yes, it’s colder than normal… and yes, snow is rare on April 9 in Ohio. But not that rare. The last time it did, in fact, was… 2016.